Is your business prepared for disruption? Gain insights into the digitization of money, including challenges and opportunities of this new frontier. 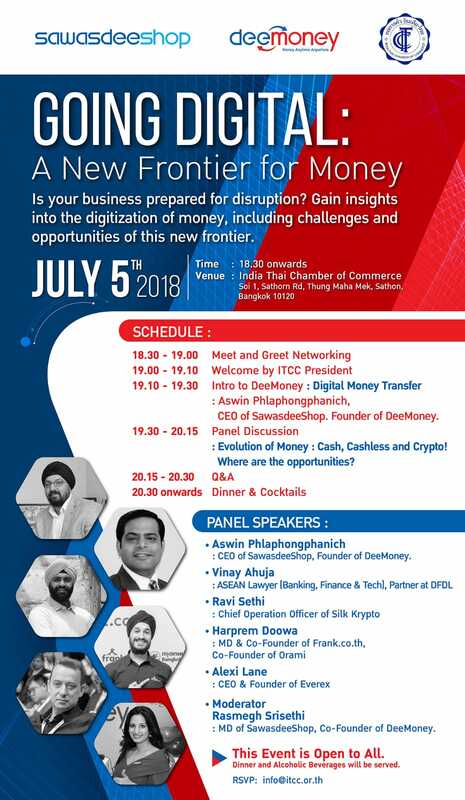 7:10pm – 7:30pm: Intro to DeeMoney – Digital Money Transfer by Aswin Phlaphongphanich, CEO of SawasdeeShop, Founder of DeeMoney. 7:30pm – 8:15pm: Panel Discussion – Evolution of Money: Cash, Cashless and Crypto! Where are the opportunities? Dinner and Alcoholic Beverages will be served.